“It is full of bad and unwise provisions that will restrict free speech and grassroots political activity,” a Heritage Foundation legal fellow says of the bill championed by House Speaker Nancy Pelosi. House Democrats tentatively have set a vote this week on election legislation that conservatives say would inhibit states’ powers to set qualifications for voters, remove safeguards on voter registration rolls, and undermine the integrity of elections. 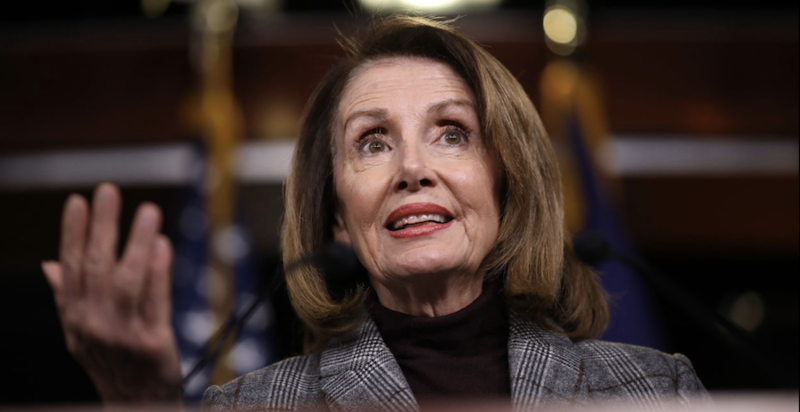 “HR 1 is one of the worst bills introduced in Congress in recent memory,” Hans von Spakovsky, a senior legal fellow in The Heritage Foundation’s Edwin Meese III Center for Legal and Judicial Studies said, referring to the number of the House’s first bill of the new session. “Many parts of it are unconstitutional and it is full of bad and unwise provisions that will restrict free speech and grassroots political activity, as well as hamper the ability of state government to ensure the security and integrity of the election process,” von Spakovsky told The Daily Signal in an email. In a Facebook Live interview with the conservative advocacy group FreedomWorks, Rep. Andy Biggs, R-Ariz., said the Democrats’ bill is an attack on Americans’ freedoms. “There’s a reason why there’s a lot of people in one party who are voting for this, and I don’t know whether they believe in the Constitution or not. But what it means is they know what this is going to help them irrigate more power to them and continue to try to stomp down on the power of the people,” Biggs said of the legislation. Rep. Denver Riggleman, R-Va., who joined Biggs in the Facebook Live video, said the Democrats’ bill would harm states’ rights as well as voting rights. “Now they are not only taking away any ability of the states to draw their own [voting] districts and create their own election law, they are also ensuring that the taxpayers are footing the bill for politicians, who probably should be raising their own money for this,” Riggleman said. Democrats say the legislation would fight corruption and promote democracy. Should the legislation pass the Democrat-controlled House, it likely would face significant obstacles in the Senate, where Republicans hold a majority of 53 seats. Although Democrats are promoting HR 1 as a bill that would ‘strengthen our democracy and return political power to the people,’ it is an anti-democratic bill that would wreak havoc on our election system by manipulating election rules in favor of Democrats. It is nothing but a progressive power grab, and all Republicans in Congress should vote against it. 1. Seize the authority of states to regulate voter registration and the voting process by forcing states to implement early voting, automatic voter registration, same-day registration, online voter registration, and no-fault absentee balloting. 2. Make it easier to commit voter fraud and promote chaos at the polls through same-day registration, as election officials have no time to verify the accuracy of voter registration information and cannot anticipate the number of voters, ballots, and precinct workers that will be needed. 3. Hurt voter turnout through early voting by diffusing the intensity of get-out-the-vote efforts while raising the cost of campaigns. Voters who vote early don’t have the same information as those who vote on Election Day, missing late-breaking developments that could affect their choices. 4. Degrade the accuracy of registration lists by automatically registering individuals from state databases, such as DMV and welfare offices, by registering large numbers of ineligible voters, including aliens as well as multiple or duplicate registrations of the same individuals. 5. Constitute a recipe for massive voter registration fraud by hackers and cybercriminals through online voter registration not tied to an existing state record such as a driver’s license. 6. Require states to count ballots cast by voters outside of their assigned precinct, overriding the precinct system used by almost all states that allows election officials to monitor votes, staff polling places, provide enough ballots, and prevent election fraud. Mandates no-fault absentee ballots, which are the tool of choice for vote thieves. 7. Prevent election officials from checking the eligibility and qualifications of voters and removing ineligible voters. It would restrict official from using the U.S. Postal Service’s national change-of-address system to verify the address of registered voters; participating in state programs that compare voter registration lists to detect individuals registered in multiple states; or ever removing registrants due to a failure to vote, no matter how much time has gone by. 8. Cripple the effectiveness of state voter ID laws by allowing individuals to vote without photo identification and merely sign a statement in which they claim they are who they say they are. 9. Violate the First Amendment and perhaps cover a vast range of legal activity. Voter intimidation or coercion that prevents someone from registering or voting is already a federal crime under the Voting Rights Act and the National Voter Registration Act. But HR 1 adds an additional provision to prevent interference with registering or voting that is so vague that it could easily interfere with free speech and other lawful activity. 10. Expand government regulation and censorship of election campaigns and political activity and speech, including online and policy-related speech. HR 1 imposes onerous legal and administrative compliance burdens and costs on candidates, citizens, civic groups, unions, corporations, and nonprofit organizations. Many of these provisions violate the First Amendment, protect incumbents, and reduce the accountability of politicians to the public. 11. Reduce the number of Federal Election Commission members from six to five, allowing the political party with three commission seats to control the commission and engage in partisan enforcement activities. 12. Prohibit state election officials from participating in federal elections and impose numerous other “ethics” rules that are unconstitutional or unfairly restrict political activity. 13. Require states to restore the ability of felons to vote the moment they are out of prison. Section 2 of the 14th Amendment gives states the constitutional authority to decide when felons who committed crimes against their fellow citizens may vote again. Congress cannot override a constitutional amendment with a statute. 14. Transfer the power to draw congressional districts from state legislatures to “independent” commissions whose members are unaccountable to voters. HR 1 makes it a violation of federal law to engage in “partisan” redistricting and mandates inclusion of alien populations, both legal and illegal, in all redistricting. This is an anti-democratic, unconstitutional measure that takes away the ability of the citizens of a state to make their own decision about redistricting. 15. Violate separation of powers and directly interfere with the president’s constitutional duties. HR 1 bans the president’s political appointees, such as the attorney general, from participating in, directing the defense of, or assisting in any matter (including lawsuits against a president’s policies, programs, executive orders, or his enforcement of the law) in which the president is named as a party.